Cremorne Point Manor: Feeling Grand For Inspiring Designs? Feeling Grand For Inspiring Designs? Returning yet again to popular demand, Grand Designs Live 2014 will be open to the public in Sydney on 24 – 26 October. As a spin off from the TV series, this is a great three day event where you can find the best ideas and advice to pamper up your abode. Alongside meeting and chatting with TV celebrities from the series, there are a multitude of exhibition demos and booths that will get you reconsidering that mossy green wall paper in the spare room. With over 200 exhibitors with hundreds of products at the show, this is an ideal way to either ponder about a full home refurbishment or focus on one area that requires that extra touch of decorating pzazz. The show includes all areas of home décor from interiors to kitchens, bathrooms, outdoor and building. This year, the exhibition features a new upgrade called Designs Arcade. This is where you can snoop around for house wares from the country’s up and coming designers. It’s a great way to support local talents and grab some unique catches that may one day, be a collector’s item! Looking to make those small spaces sparkle and need ideas on decluttering? Don’t we all! There will be a dedicated focus on nooks and crannies, storage innovation and how to blend colour. Once you get started, there will be no stopping you so maybe take photos of each room and outdoor area of your home to show these to the designers, and they can give you solid advice on décor options. Prime TV celeb, Kevin McCloud will also be walking the floors and talking at the expo in the Lifestyle Channel Grand Theatre so you better book your tickets early. The VIP tickets have sold out but the other tier tickets between $75 and $115 AUD are still available. Check the website’s What’s On page which includes specifics about showcase events such as the Tech Box, Design Arcade, Sustainability Stage and Grand Show Gardens, just so you don’t miss out on anything. The beauty of all who are visiting Sydney on business or for fun, is that the expo’s taking place at the Conference and Exhibition Center. So what better way to end each day than taking a short ferry ride to an affordable, boutique Sydney hotel and be inspired by the sun setting over the famous Harbour Bridge. 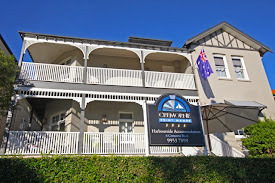 If you check out Cremorne Point Manor’s website home page, take a look at the quick visual tour of the hotel and surrounding views. Inspiring doesn’t even begin to describe it!